Fire is a risk for every hospitality facility and can pose a serious threat to occupants and property. An incident at Sydney’s iconic Lansdowne Hotel earlier this year highlighted the potential danger of fire in high occupancy hotels and facilities. A hospitality facility is likely to have a large number of staff and guests on site at any given time. Considering the busy kitchens and extensive range of facilities and equipment onsite, the fire risks within these facilities can be vast. Other common hazards include careless guests, missing or broken fire safety equipment, locked exit doors, accumulated rubbish, blocked stairways, open fire doors and inoperative exit lights. If you’re a hotel owner or manager it’s your responsibility to ensure your facility is safe. While it is not always possible to prevent a fire, every effort should be made to ensure staff, guests and property are protected. A suitable fire safety plan should be developed in accordance with applicable State and/or Territory regulations, building codes, occupational health and safety requirements and associated relevant Standards. The fire protection requirements for any given hotel or facility will differ depending on size, layout and the facilities provided. The choice of fire safety solutions ranges from portable equipment to automatic sprinkler systems and early warning detection systems which can be integrated into a hotel’s management system or control room. Hotel managers should always consult with a recognised fire specialist to assist in identifying what is required. 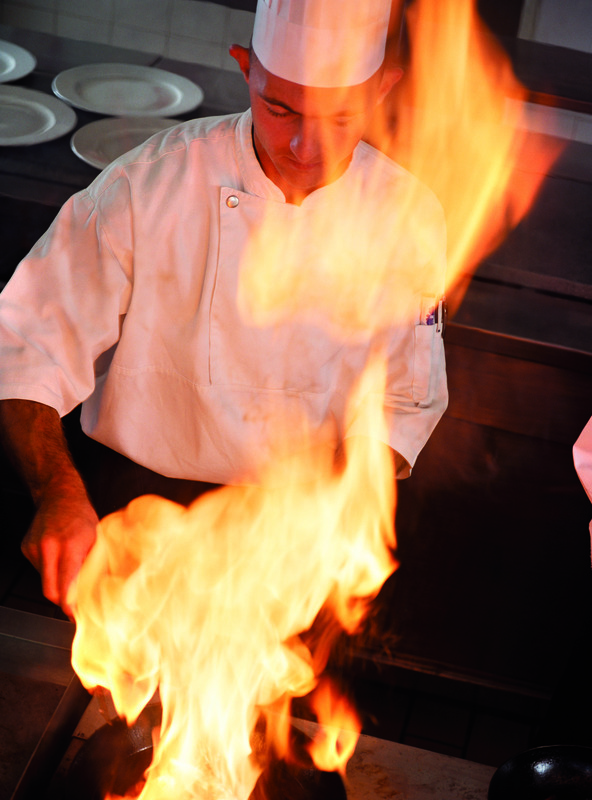 With open flames and a vast array of cooking appliances, busy hotel or facility kitchens present serious fire risks. Fire protection systems are available that are designed specifically for use in commercial kitchens with high temperature cooking oils and slow-cooking appliances. For example, Wormald offers the PIRANHA® kitchen fire suppression system, which is specifically designed to discharge a wet chemical liquid fire suppressant for rapid flame knockdown of burning oil. Also available is the ANSUL® R-102 system which can be installed directly into the hood and ductwork of cooking appliances to release a liquid fire suppressant when the temperature in the hood reaches a predetermined level. To help contain a fire and prevent the spread of flames, gases and smoke, corridors should be fitted with fire doors. Exhaust fans should be installed in emergency stairwells to prevent the build up of smoke in these essential escape routes. To ensure guests and staff know what to do to get to safety quickly, evacuation plans should be developed and visibly displayed in each bedroom and around the hotel or facility. Emergency lights can help guide occupants to the nearest safe exit and some advanced solutions can even be integrated with fire detection, building automation, public address and other control systems to react to the emergency as it unfolds to guide people to safety. A rapid and competent response to a hotel or facility fire incident will help reduce the impact of a fire crisis. Providing practical skills training to staff will give them the confidence to react quickly to a fire and help make guests feel safe. Training options available include fire extinguisher training, fire safety officer training, evacuation exercises, emergency awareness training and first aid training. A handy business fire safety checklist, which is available here, may prove useful when preparing for fire protection at your hotel or facility. This entry was posted in Fire protection planning and tagged commercial kitchen fire protection, hostel fire safety, hotel fire safety, hotel safety by wormaldblog. Bookmark the permalink.